Now is the time to raise our voices into a roar that can’t be ignored. The visual campaign is already well underway, and I was thrilled to include my thoughts. Click on the image above for a closer look, or go here. But I want to do more. Renee and I are already taking a look at the ratio of diverse to not in our query inbox, and we’ll be posting a status report on that shortly. But rather than just look for it in what I’m already being sent, I want to seek it out. For the next week or so, until May 9th, send me your racially, socially, sexually, diverse and multicultural YA and MG queries with the hashtag #WeNeedDiverseBooks in the subject line, and we will respond within ONE DAY. I still have to be blown away by your story and your writing, but I want to put my focus and attention where it matters — in making sure my bookshelves reflect the diversity of the world we live in, and that my children are growing up in. If you’ve already sent a query that would fit with this request and are waiting on a response, rest assured we’re going through all of those as well, and we’re going to get caught up as fast as we can. This is my concrete action. Come on. Let’s make a success story. ← Another Round of #10queriesin10tweets! Awesome! So glad someone is actually making a concerted effort rather than just paying lip service like so many other folks…. "Bollywood goes steampunk?? Finally some diversity? 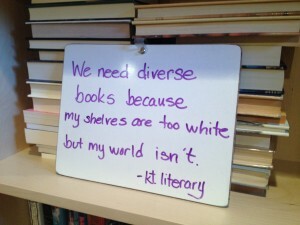 Well yes, I have read a little more diversity this year, but not nearly enough." "It is so rare to find a book with one good character of colour, let alone one based on the society of a culture of colour and this is particularly true of the steampunk genre." And for every review that applauds the diversity of the book (it's set in an analogue India), there are more than don't mention it, just love the story. Both kinds tell me that there is both a clamoring for, and acceptance of, books with diverse characters in a non-Western culture. Which couldn't make me happier. I hope you find the right book and get it out there on the shelves! There's definitely a desire for it. Question: In writing my query, I've always wanted to highlight at least one of the two characters of color in my MG story, esp. since there's a gentle interracial romance between one and the white MC, but the story is adventure and not primarily about the characters' diversity or the romance. Any time I've written the query I've been told to simplify it by sticking to the adventure plot and drop the subplots, which also drops any need to mention the multicultural characters (even though they are part of the adventure). Do I just say somewhere in the letter that the book is multicultural? I have the same issue! My story is mainly about personal growth of the MC, but there's a side plot of interracial romance. It's hard to convey that in the query since that's not the main point. I've tried to include it, but worry it makes the story seem like it's all over the place when in reality it's not. Yes, it is complex with multiple themes, but they all work together in the manuscript. If you get an answer to this, please let me know! Sorry to not respond to these questions sooner. I think right now, where so many agents are specifically looking for diverse stories, you should try to find a way to mention the interracial romance, even if it's just as an aside. You might not want to give too much detail if it takes away from the main story line, but I do think it's worth mentioning. I'm so happy that you guys did this. Thank you for helping support the spirit of the campaign. I'm disappointed I missed it (I went on vacation). I hope you found some wonderful stories! Just to reiterate what I said on Twitter – just because the deadline of May 9th passed doesn't mean that we're not still looking for diverse reads! It just means we're not longer promising a 24-hour turnaround! Hi! So this is great to hear. I have a quick question though. By “diverse” do you mean it has to have some kind of plotline that involves another culture in some way? Or do you just mean we don’t want all the characters to be white? The two main characters of my novel are two guys–one black and the other half-asian. They are both in love with the same girl, who happens to be white. But NONE of that is what the novel is about. It’s just who they are. So, is the book diverse, or not? Hi Tamara — I’d love to see other cultures more regularly represented, but I also mean non-white, non-hetero. Hi Kate–I just saw this reply and wanted to thank you for taking the time to let me know. I’ve read a lot more about diversity since I saw your post and, in doing so, realized that my MC suffering from OCD and being raised in a Hindu household are both things that I previously left out of the query. Given how many agents are looking for diversity, I now know both points should be addressed. As such, I’m quite glad I came across your post on this! I will definitely be querying you when the book is finished. Thanks again! visit of this web site; this webpage carries remarkable and in fact excellent information designed for readers.